Sharing is fundamental for every organization that wants to grow, but what does it really mean? Can you remember the last time you learned about the meaning of sharing? It was probably some time in grade school. 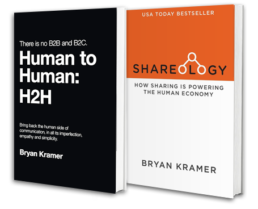 But for today’s businesses, sharing is essential for growth. It used to be that companies themselves were the gatekeepers of information that consumers needed. Marketing departments, corporate executives and traveling sales reps were the sources that people turned to when they wanted information about something they were interested in buying. That script has flipped almost completely. These days, the problem isn’t getting the information: it’s getting the right information. With so many brands offering content to their audience, there’s a huge amount of noise. And the amount is only increasing: did you know that 90% of the data in the world has been created in the past two years? It’s not necessarily the act of sharing that’s essential to growing your brand. If you share irrelevant or unhelpful content, it won’t resonate with your target audience. Instead, you need to share content that adds value for them. This is what makes your story worth telling, and why sharing is necessary: it strengthens the ties between you and your audience. Sharing is not only necessary, it now drives commerce. 73% of people prefer to get information about an organization through a series of articles rather than in a traditional advertisement. Is Sharing a Science or Art? In the world of sales, everyone knows there are a few different types of workers. Some reps succeed because of their unwavering devotion to the science of selling: these salespeople have crunched the numbers to figure out what their exact close rate is, how many calls they need to make each day and week, and so on. On the other hand, you have reps who are much more instinctive. They rely on an ability to truly listen and connect with their prospects. These sales reps have rules, but they aren’t shy about straying from them when the need arises. This same dichotomy applies to sharing: there’s no black and white answer about how much of your sharing should be scientific, and how much should be intuitive. It’s a good idea to start with a more scientific goal: sharing as a way to boost traffic or increase conversions or click-throughs. But once you get started, you’ll need to really analyze the type of sharing your business is doing and make sure it aligns with what your instincts tell you about communicating with your audience. This is the artistic part of sharing: eventually, the two sides will settle into an even balance with each other. Key Takeaway: Sharing is necessary for growth, because it builds relationships with your audience and establishes your brand as a source of value. For best results with sharing, use a good mix of scientific goals and instinctive interaction, and make sure your sharing campaigns aren’t one-way streets.